Join us and our 34,000 member churches as we work to improve our communities. NBCI is organized by dividing the country into five geographic areas. We divide every metropolitan city and rural area into key churches. These churches are placed strategically to cover all geographic areas. The number of key churches that we designate for any given area depends upon the size of the population of the state or the city. For example, a city like the District of Columbia that has a population under 1 million, has 24 key churches. A city like Chicago or Atlanta has 78 to 100 key churches. Those churches that surround the key churches are called cluster churches and they feed into those key churches for information and programming. 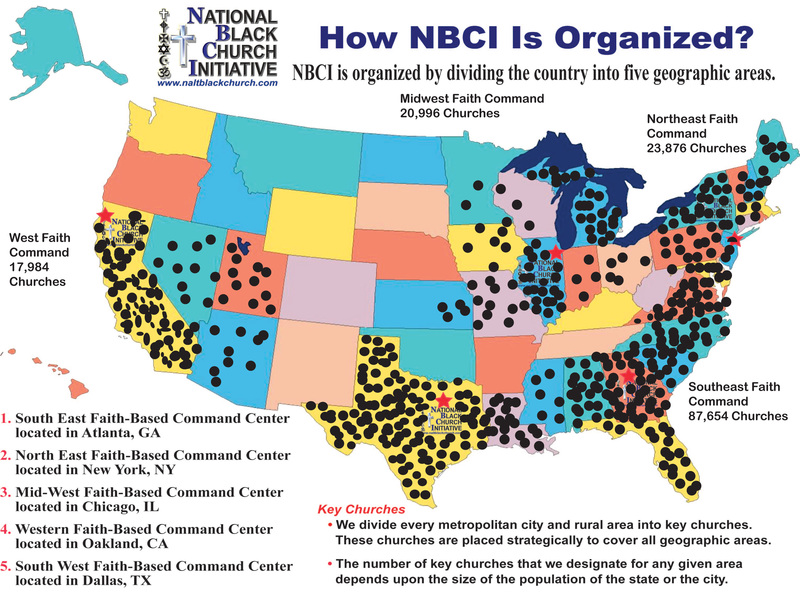 NBCI has 34,000 churches. Because of our enormous size, we are able to conduct targeted distribution of health literature and other materials. This makes us one of the largest distribution networks in the country. We can easily limit this distribution network to NBCI churches, NBCI sister churches, or other churches outside our distribution network. With this enormous distribution network, we can touch every metropolitan and rural area in the country where African Americans and Latinos reside. We also have the capacity to create literature both in Spanish and in English. Having this reach gives us a unique service to reach into metropolitan areas and deliver literature to zip codes, wards of cities (city election boundaries), as well as to certain neighborhoods. Over the years, we have been able to perfect this particular distribution network. This is one of NBCI’s strong suits, and we are developing new techniques and strategies to improve the accuracy and speed of delivery of critical health information and other materials that will strategically affect the African American and Latino communities. In the future we are looking to incorporate our technology information initiative by connecting key churches through wireless communication. We accomplish this task by sending the literature to our key churches that, in turn, distribute that literature through our cluster churches. With this type of accuracy we are able to target certain churches, individuals, genders or races. We have the capacity to distribute large volumes of health information to target populations for specific health concerns. We can deliver gender specific health literature to women concerning breast cancer, heart disease and other diseases like osteoporosis. If we are talking about breast cancer, we are one of the few national organizations that have the capacity to distribute a large volume of health information to women who are a part of our congregations. The targeting of those women for this literature is usually done by the Center of Diseases Control (CDC). CDC concludes that a particular age group is vulnerable to this disease state and should be tested. NBCI surveys its congregation and maps out a strategy to deliver targeted information to a specific group of women in our congregation. We also have the ability to identify or target health information for men. If the literature is for men who are fifty-five and over concerning a disease like prostate cancer or other male diseases we will provide the same manner of information distribution within our congregations for them. We are able to accomplish this task through the NBCI /DCBCI Health Note.